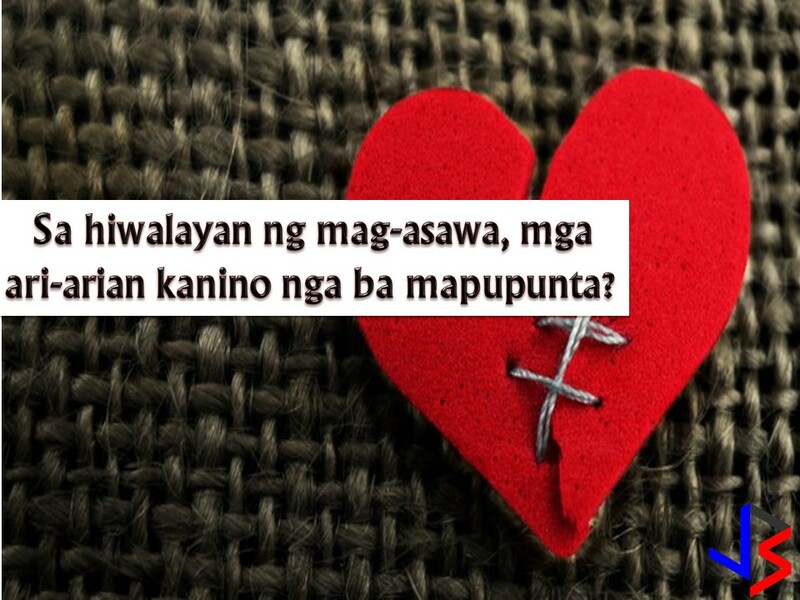 Giving everything you have for the person you love is easy especially if a person is truly, deeply, and madly in love. Many promises have been made as if it will be forever. But in cases where couples separate, giving a portion of what you have is painful, insomuch more if the couple is married where sometimes, the court decision is needed just to split what they have - properties. 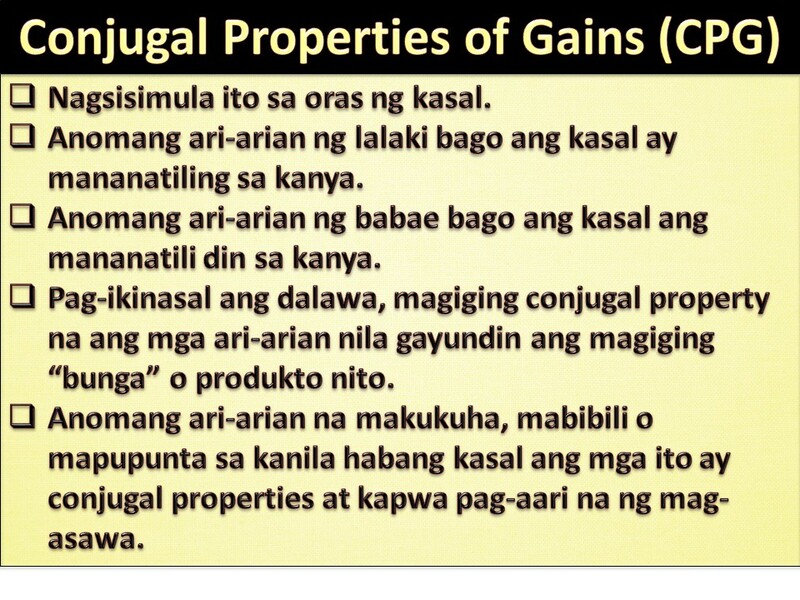 We often hear about the word "Conjugal Property". But what is that mean? Those acquired by either or both spouses through their efforts or by chance. The CPG It begins at the precise moment when the marriage is celebrated, exactly like in absolute community of property. Any property acquired before the husband got married shall be exclusively his. Any property acquired before the wife got married shall be exclusively hers. When the man and woman get married their exclusive properties shall be joined-together as part of one estate within the conjugal property and the "fruits" of those properties shall be shared between the husband and wife for the duration of their marriage. Any property acquired during their marriage shall be considered part of the conjugal properties and shall be equally owned by the husband and wife. Should the-the husband and wife file for legal separation, divorce or annulment, the exclusive property of the husband which he acquired before the marriage and all its’ fruits, shall be taken out of the conjugal property and will be again solely owned by him; and likewise the exclusive property of the wife and all its fruits, which she acquired before the marriage shall again be solely owned by her. 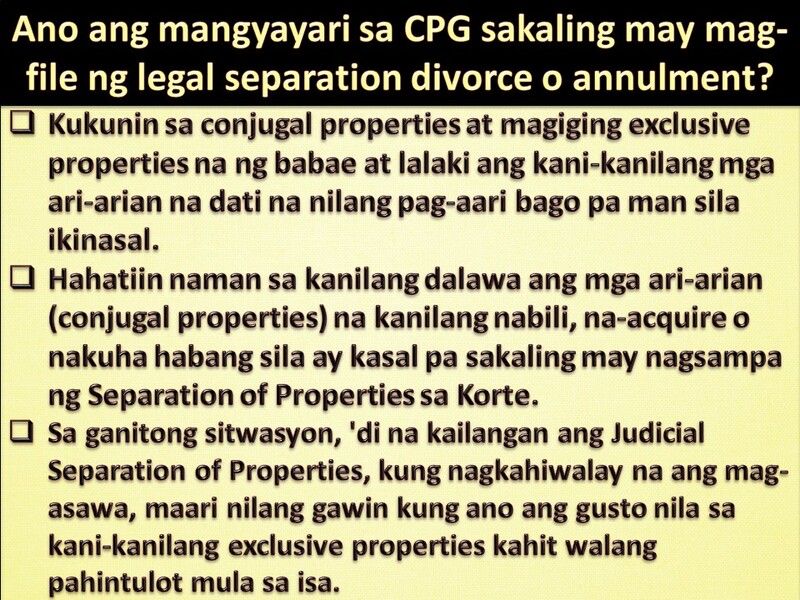 Also, in case of legal separation, divorce or annulment, and the spouses filed for separation of properties in court, the properties acquired by both or any of the spouses during their marriage shall be considered part of their conjugal property and shall be split in half between the husband and the wife. In this scenario, should there be no Judicial Separation of Properties, when the married couple gets estranged, either of the spouses can sell, lease, mortgage, exchange or joint-venture their exclusive properties acquired before their marriage, even without the consent of the other spouse. If the property was acquired during the marriage, notarized written consent from both spouses is still needed to sell, mortgage, lease, exchange, donate or joint-venture the Conjugal Property. 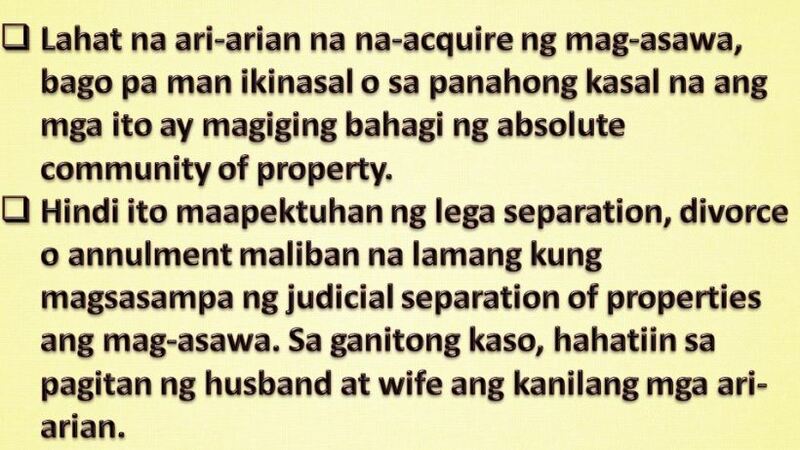 This law was practice before the 1987 Family Code of the Philippines. But under the Executive Order 209 or the Family Code of the Philippines when it was enacted as law on July 6, 1987, by then President Corazon Aquino, Filipinos who were married after that date are now covered by this law. 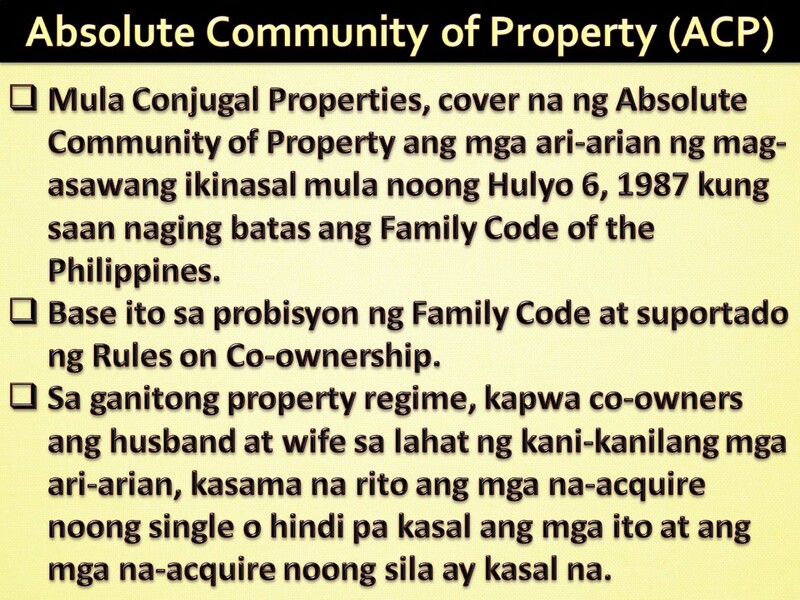 In the absence of a “Marriage Settlement” or what is commonly known as “Pre-nuptial agreement” that separates the properties of the spouses married after the enactment of the Family Code, their properties shall no longer be governed by the law on the conjugal property but by the regime of Absolute Community of Property. All properties acquired by the spouses during their marriage and all properties acquired during their marriage shall be considered part of one whole estate of the absolute community of property owned by both spouses. All properties donated, inherited and/or properties given gratuitously to either of the spouses before their marriage shall also be considered as part of the absolute community of property once they get married, and shall be owned by both spouses. In case of legal separation, divorce or annulment, the regime of absolute community of property shall not be affected and will remain owned by both spouses, unless the spouses filed for judicial separation of properties. In case the spouses filed Judicial Separation of Properties, the properties within the Absolute Community of Properties shall be split in half between the husband and the wife. In this scenario, all properties acquired before and during the marriage of either and both spouses shall be considered as part of one whole estate of the Absolute Community of Property. Therefore, notarized written consent from both spouses shall be needed in order to sell, mortgage, lease, exchange, donate and joint-venture any real property that belongs to the absolute community of property. Unless there is a Judicial Separation of Property, even if the spouses get estranged, separated, divorced or their marriage annulled, it will not affect the regime of absolute community of property, hence notarized written consent from both spouses shall be needed to sell, mortgage, lease, exchange, donate and/or joint-venture the said property. This article is a product of research, please consult a lawyer of your choice if you have more question regarding issues about conjugal properties.